Oh, you most certainly do have illusions about that. You think there's an incipient genocide out here in the real world? Ouch, that joke sure didn't land correctly. No, I meant that what's in his head is already scary from here (outside); I don't want to delve further. ETA: There was also a double meaning about Travis being ugly, but it was not the original intent. Last edited by Belz...; 2nd November 2018 at 07:20 AM. No one I know feels it would just be executing criminals. Not yet, no. But take a look at any of the "Xing while Black" threads to see how many Republican types go out of their way to find after-the-fact justifications for killing people. They won't feel it now, but I'd give good odds on a lot of them feeling it then. No republican I know supports execution for crimes of this nature. And no Republican I know "supports" suppressing legitimate voters. But they end up doing exactly that by convincing themselves that the people being suppressed aren't legitimate voters. If you believe this you live in a sad scary world. If you don't believe that this is at least possible, you haven't been paying attention. All of the things Squeegee Beckenheim refers to are things that no one would have believed Republicans would have supported, if we'd been speculating about it a few years ago. And yet, here we are. Really? 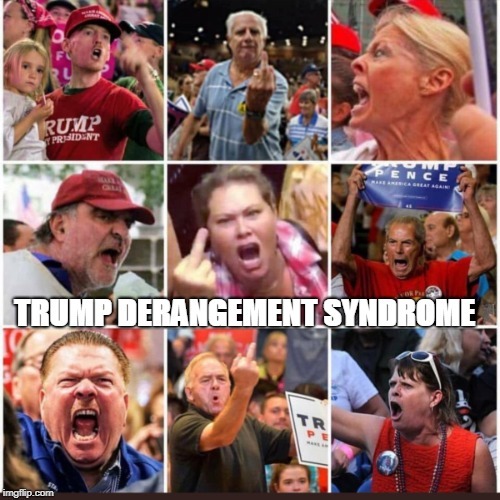 The scum at those rallies seem pretty excited about Trump's claim that the troops would fire on migrants. It's not a far step. I thought they did want to apply through the proper channels but Trump is trying to stop them from doing so? I don't think Trump has banned applying to enter the US, or stopped all immigration. At the end of the day if someone applies and their application is denied then they can't get in. At no point is there a mandate to riot. Looks like someone has been drinking the Kool-Aid. Not a good look if one wishes to be taken seriously. You know your link doesn't negate the claim, right? Although I don't think actual death camps are on the way, and as usual Travis' interpretation of reality is.... er... detached, I wouldn't say it's ridiculous either. I'm sure a lot of people in Germany and Cambodia didn't think it would happen there, either. Ah, OK, got it. Say no more. Last edited by JoeMorgue; 2nd November 2018 at 07:43 AM. Hopefully by "attack" you meant throwing large rocks at police officers, not the very act of immigrating to the US. I don’t believe most of the things Squeegee Beckerheim claims have actually happened. I also don't think the posts in “while black” threads are about justifications for killing innocent people. Last edited by eeyore1954; 2nd November 2018 at 08:05 AM. We're really like an old couple, aren't we? Somebody agree with Travis that Trump is going to round people up into camps and the Right is all going to be okay with it so Travis can feel satisfied that his rage is justified. Addicts don't get satisfied with their addiction. You can never catch the dragon. Care to look at gang murders in L.A.? Most are done by illegals. more trump talk, not as smart as "rock talk"
Yes, the stable genius talks, and don't forget, trump says 'Consider rocks as rifles'. Did President Trump say that? I don't think so. He did make a ridiculous statement about rock throwing being considered the same as a rifle. Are you any less hateful towards those who disagree with you than the "scum" at those Trump rallies? The implication is that if the migrants throw rocks (presumably because their entry into the US will be blocked; and I'm not sure how legal that is) the officers will shoot back. Well, then, you're completely detached from reality. Welcome to the club. Yes, throw rocks at armed soldiers whilst trying to break across a border into a foreign country and expect repercussions. It demonstrates the calibre of some of those trying to enter the US. They can't immediately gain access, they don't want to apply through the proper channels, so immediately they riot. I imagine none of those proposing these immigrants be let in face the risk of living next door to them. I wonder what would happen if I turned up without a passport at a US airport and tried beating security with a rock. That's not how asylum works and you know it. Everyone knows it. It's repeated over and over in these threads. They ARE going through the proper channels. You have to be here to apply for asylum. You can't do it before you come here. Last edited by phunk; 2nd November 2018 at 08:27 AM. "A specified number of legally defined refugees who either apply for asylum from inside the U.S. or apply for refugee status from outside the U.S., are admitted annually." And I think you know that once the application is made, wherever that may be, most do not have a hope in hell of satisfying the criteria by which one is deemed a refugee. There is a difference between refugees and asylum seekers. I get this adds a new wrinkle to this clustermuck but if on a moral level if conditions in Country A are so bad that not letting people from Country A into your country to allow them to escape Country A is a moral failing, I'd argue you have an equal moral imperative to try and fix the problems in Country A.
I would think a post like this is a disservice to people who suffered in real concentration camps except I think you believe they are similar. Can you explain how they are different? BTW you don't need to explain how they are different from a Nazi concentration camp of WWII, but those were not typical. This does sound typical of typical concentration camps. ETA: Note that wikipedia makes a distinction between concentration/internment camp and Nazi concentration camp. Last edited by RecoveringYuppy; 2nd November 2018 at 09:18 AM. Sounds like you're volunteering to substantiate the original claim. I eagerly await you to report back with your findings. Except that these are the same people who say things like "Mexican isn't a race", so it wouldn't be genocide in their minds. To them, it's just executing criminals, which we know Republicans strongly support. I don't personally know any Republican who would support executing a person simply for illegal immigration. Let's stop exaggerating the evil of our political opponents. At present, Republicans (at least Trump supporters) have enough to answer for. The general term concentration camps in my mind now refers to the Nazi type. Travis talking about finding a quarry also implies death camps. There may be nice modern “concentration camps” I am not aware of. Trump and his supporters are big fans of violent criminal assault. You don't think people who celebrate violent criminal assault deserve to be called scum? What might this topic actually be about? I pay pretty close attention to the news, and no one else seems to think that "Trump announced new concentration camps" yesterday. What did I miss? The latter becomes the former (or can do), I understand that. But you said they could not take the legal route of application without entering the US. The cite I quoted states this to be false. So have you any evidence what you said is correct? Last edited by baron; 2nd November 2018 at 09:20 AM. Very, very, very few people would stand by for US citizens being tortured and incarcerated indefinitely without trial. Very, very, very few people would stand for open white supremacists in the White House. Very, very, very few people would stand for a hostile foreign power interfering in US elections with no repercussions and no preventative measures for future elections. Absolutely no questions needed for this one! ...or point out that your link does not claim what you say it does. Which I did. You didn't miss anything except a need to feed the outrage machine. Sorry, are there really threads about "crossing while black"?